This section of FAAST is focused on providing Ontario farmed animal owners with the knowledge and tools they need to access and responsibly use antimicrobials. Below you will find a series of information sheets (or FAASTsheet) reviewing the upcoming policy and regulatory changes related to antimicrobials, along with key tools and recommendations for reducing antimicrobial use without compromising animal health or food safety. Antimicrobial Resistance: What is it and Why is it so Important? Antimicrobial resistance has been called the global health crisis of our time. This FAASTsheet explores the impact antimicrobial resistance has had on human and animal health and the consequences of doing nothing. Good communication with your veterinarian and staff is critical to animal health. This FAASTsheet explores best practices for working with your veterinarian to prevent illness, promote health, and improve antimicrobial stewardship on the farm. Health Canada has categorized veterinary antimicrobials based on the preference for use in treating human illness and the availability of alternatives. This FAASTsheet reviews Health Canada’s classification of antimicrobials and drugs that fall into these categories. As of November 13, 2017 animal owners can no longer import medically important antimicrobials from other jurisdictions for use on their own animals (with some exceptions). Click on the FAASTsheet below to learn more about this regulatory change. A valid VCPR must be established prior to a veterinarian treating or providing services to a client and their animal(s). This FAASTsheet reviews the importance establishing a VCPR with your veterinarian. As of December 1, 2018 a veterinary prescription will be required to purchase medically important antimicrobials. Click on the FAASTsheet below to learn more about this policy change. As of December 1, 2018 a number of changes are being implemented that impact the ways in which animal owners can access prescription medicated feed. Click on the FAASTsheet below to learn more about these changes. As of December 1, 2018 there will no longer be growth promotion claims on veterinary drugs containing medically important antimicrobials. Click on the FAASTsheet below to learn more about this change. As of November 13, 2017 new rules have been introduced to facilitate the approval of, and more rapid access to, Veterinary Health Products. Click on the FAASTsheet below to learn more about these changes. 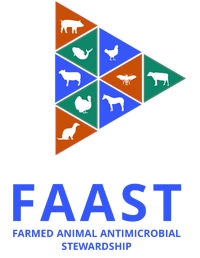 The Farmed Animal Antimicrobial Stewardship Initiative (FAAST) aims to tackle resistance head on through education, collaboration, and engagement across the value chain. We believe in promoting the stewardship of antimicrobials today, for a sustainable tomorrow.